Braehead's eight sheet curling rink is home to over 50 clubs and has over 1200 members of all ages and abilities. Members and spectators alike have access to a bar and restaurant with views of the curling rink and River Clyde. The World Curling Federation (WCF) is the world governing body for curling accreditation, with offices in Perth, Scotland. 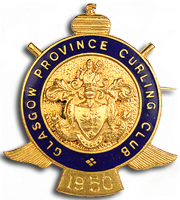 The Glasgow Province Curling Club have their own Website with Member Club details and Competition updates. The Royal Caledonian Curling Club (RCCC) is the mother club of the sport of curling, and the governing body of curling in Scotland. The RCCC was founded on 25 July 1838 in Edinburgh, and granted its royal charter by Queen Victoria in 1843, after she had witnessed a demonstration of the sport played on the polished ballroom floor of Scone Palace the previous year. The Glynhill Ladies International (formerly the Braehead Ladies International) is an annual tournament. The tournament, sponsored by the Glynhill Hotel, has been a part of the World Curling Tour since 2008. The tournament is held in a round robin format.